Our CMT carbide tipped Rabbeting Bits Sets, are fast and accurate - you can quickly produce inset doors and drawer fronts, make strong rabbet joints, mill perfect tongue and groove joints, they can even be used as a flush trim or pattern following bit or any number of other jobs. 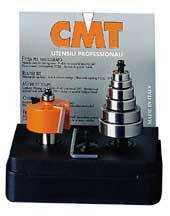 CMT Rabbeting Sets allow you to make a limitless number of cuts by adjusting the cutting height on your router and changing the bearing on the bit. Each set comes complete with one rabbeting bit with 3/8� bearing assembled and six changeable ball bearing guides, which is also sold separately. Important: always assemble the black bearing heat shield with the raised side up when changing the bearing. Improper assembly will cause the screw to come loose and the bearing to fall off when working.